Dew Claws: What's All The Fuss About? Dew Claws? What's All The Fuss About? Cocker Spaniel dew claws are often removed when the puppies are only a few days old. Some feel this is outdated and cruel, but does your dogreally need them? 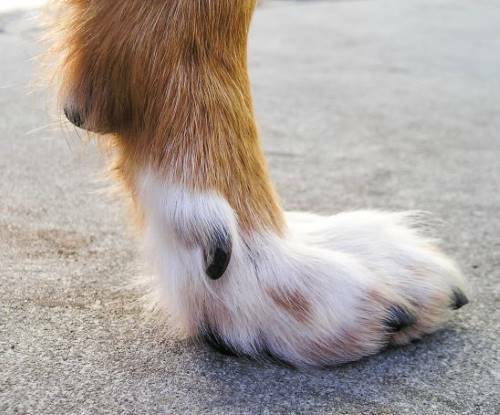 Read on to learn more about your Cocker Spaniel's 'fifth toe'! What Exactly Is A Dew Claw? It's a short nail or claw attached to a small 'stub' on your Cocker's legs, like the one in this photo. Obviously this is not a Cocker Spaniel. Max had his removed so it wasn't possible to show you his. Besides, I felt it would be easier to show you a claw on a dog without so much fur. These claws are placed at the back of (and to the side of) the front legs, just up from the paw (a bit like the positioning of the base of your thumb to your fingers). It's argued that they have no real function although there are those that believe they can help with maneuverability when the dog is running. Because of this, they're often removed at birth. It used to be tradition for hunting dogs to have their side claws removed because they were prone to snagging on trailing brambles or woody stems when tunneling through scrub and the undergrowth. If the claw catches and bleeds you may not even notice it with all that fur on his legs, which could be a problem because it could lead to infection. If the claw is badly torn you'll probably notice it because it will bleed profusely, and if you don't, your dog will let you know because it will be painful! Should the claw has be seriously torn your vet may be able to save it, but if that's not possible at least it will be safely removed. If your Cocker is regularly having minor snagging problems your vet may recommend that you wait until your dog is to be castrated or spayed, or is scheduled to have other surgery. This could save you some heard-earned cash as you won't be forking out twice for an anesthetic and it will certainly be less traumatic for your Cocker Spaniel! Regardless of whether the dog is a show Cocker or a working Cocker, many breeders have the claws automatically removed when their puppies are young, usually between two and five days old. (So if you want your puppy to keep these side claws, be sure to let your breeder know before it's too late!). If the claws are removed within the first few days of birth, a general anesthetic isn't normally necessary; however the vet may decide to use either a local anesthetic or a mild sedative to help calm the puppy. Don't Forget To Trim Them! If your Cocker Spaniel still has these claws, personally, I would leave well alone unless they're causing problems. But if you decide to keep them, don't forget to trim them regularly. Just like your dog's nails, his claws can grow very long, but because they're hidden it's very easy to forget that they're there. As they grow they tend to curl back on themselves until eventually the tip of the nail begins to dig into the leg. If the claw pierces the skin, obviously it will cause your dog pain, but it can also lead to infection. The ideal time to trim your pet's claws is when you're cutting your Spaniel's nails. Check that you have everything you need before you begin. The basic essentials are: a pair of dog nail clippers; a styptic pen or loose powder; (you can also use cornflour) and a sterile bandage (just in case). Got everything? Let's do it! It's said that the term 'dew claws' originated from the fact that they're positioned at the same height as a blade of grass and that when the dog is walked through a meadow they catch the dew from the top of each blade. I can't confirm that this is true or whether it's simply an 'old wives tale,' but I like the theory! Stroke him gently and tell him he's a good boy. Place your weight (gently) across his shoulder and take one of his front legs in your hand. Gently pull the claw away from the leg and, using the clippers, snip a small amount from the tip. Remember to stay clear of the quick. It you cut into it, it will be very painful for him. If you are unlucky enough to cut into the quick, it will probably bleed for about 5 minutes. You can usually stop the bleeding by using the styptic pen or powder, but if it continues to bleed for any longer than 10 minutes or so, take him to see the vet. When the bleeding stops, wrap a sterile bandage around the claw for a day or two to stop your pet from licking it. 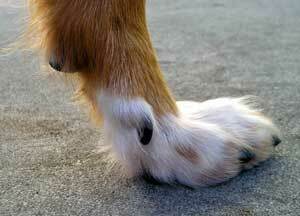 Dew Claw Photo at top of page by Elf at the English language Wikipedia. Licensed under CC BY-SA 3.0 via Wikimedia Commons .